The legacy still lives on today. The Philadelphia 76ers were hosting the Michael Jordan and the Washington Wizards. All eyes were on MJ that night, as it would truly be the last time anyone would see him playing in the NBA. He played 28 minutes and scored 15 points, while adding in four assists and four rebounds. After leaving the game in the third quarter down by 21, the crowd began chanting, "We want Mike," which led to His Airness hopping off the bench and back into the game with 2:35 left in the fourth quarter. 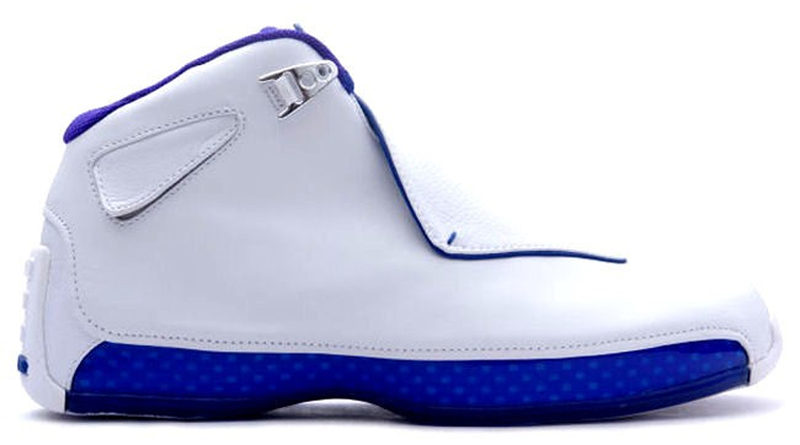 While the 18 tends to be under appreciated, the 2018 retro of the "White/Sport Royal" that Jordan wore for his final game is currently selling for an average of $285 on the resale market—$60 more than its already steep $225 retail price. On the other hand, the color suede pack that dropped later in the yeah was quick to hit sales racks, and can be picked up for far below retail today. Unlike the suede pack though, the White/ Sport Royal 18s had true significance. Sure, the 18 was worn when Jordan was well past his prime, but it gave us his last memorable on-court moment, nonetheless.